Editor’s note: The Agent Network Accelerator Kenya Country Report is the Helix Institute’s third country report on mobile money agent networks. The first report, on Uganda, is summarized here. The second report, on Tanzania, is summarized here. The Kenya report was originally published here. These reports are the result of a collaboration between the Bill & Melinda Gates Foundation and MicroSave designed to provide valuable data on agent network management, and to determine what drives their success and scale. NextBillion Financial Innovation is working with MicroSave to publish future country-specific reports. The Helix Institute of Digital Finance released its third Agent Network Accelerator (ANA) country report on June 19, in a launch event conducted in partnership with FSDK and InterMedia. The research presented was based on a nationally representative sample of 2,113 interviews with agents that were conducted across Kenya in September/October 2013, as well as 748 additional interviews with banking agents. The presentation noted that agents in Kenya were very busy, conducting a median of 46 transaction per day for each provider, which is 48 percent more than the 31 transaction per day found in Tanzania. The presentation went further to focus on four key themes that emerged from the Agent Network Accelerator Survey: Kenya Country Report 2013, namely, the proliferation of agents in the country, the effect of Safaricom’s dominance, how the network of agents is evolving, and the indicators for the impact it is having on financial inclusion. Over seven years ago Safaricom launched M-PESA in Kenya. The assumption among many is that agents in Kenya have been in operation for a number of years as well. However, the ANA research finds that 59 percent of agents have been in operation for a year or less. While it is clear that a large portion of this is explained by aggressive growth from the provider, the survey also found that only 58 percent of agents thought they would continue to be an agent in a year’s time. This indicates that there might also be a lot of turnover of agents in the network. Further, the vast number of agents is putting pressure on each of them individually, with agents ranking competition between themselves as the greatest barrier for them doing more business. Agents were selected randomly for the survey, and 90 percent of the ones engaged were serving M-PESA. Across East Africa, each country has a leading provider, with MTN controlling 63 percent of agents in neighboring Uganda, and Vodacom having 55 percent in Tanzania, but the high level of the dominance found in Kenya is unprecedented. This dominance has some interesting implications like the degree to which the country’s agent network is shared. Exclusive agents only serve one provider, and providers like to keep it that way so their competitors cannot leverage on their networks, but they need a lot of market power to enforce this aspiration. The dominance of Safaricom has allowed it to keep the most exclusive agent network in the region, with 96 percent of agents serving only one provider vs. 48 percent in Tanzania. 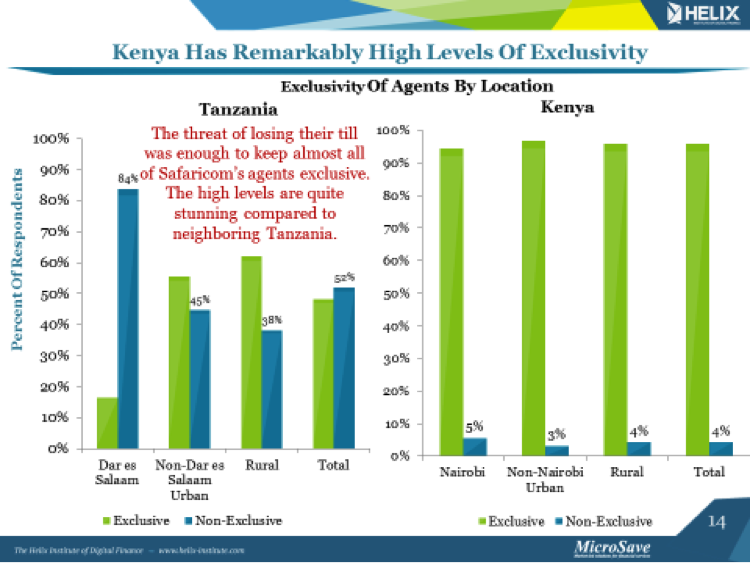 This seems to greatly impact profits for the agent since they can only earn revenue from one provider rather than multiple, and explains much of why agents in Tanzania make a median of $US 95 per month vs. only $US 70 in Kenya. 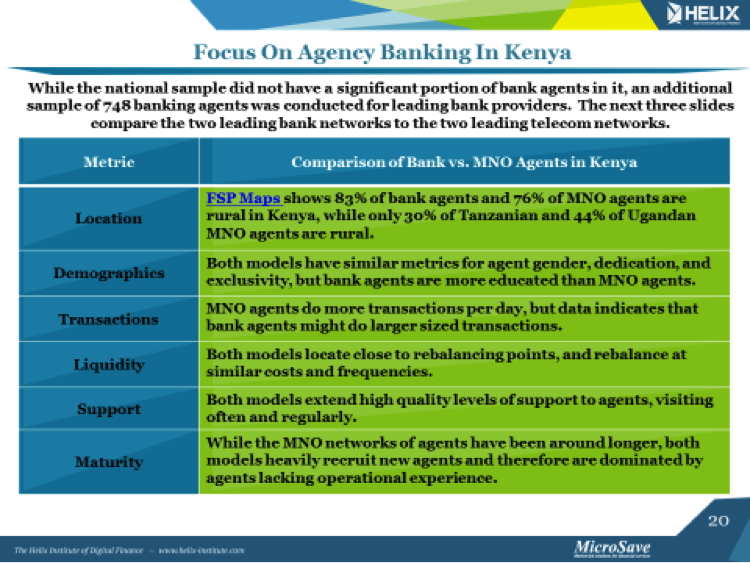 Therefore Kenyan agents do more transactions per provider, but make less money overall by serving fewer providers per agent. The agent network in Kenya, not only continues to proliferate rapidly, but is also evolving in terms of the types of agents. About three years ago, banking agents were introduced to the market, and more recently mobile money merchants began operations (see the blog on merchants in Kenya here). Banking agents are now becoming an important part of the digital financial ecosystem in Kenya and display some interesting traits. A lot of the banking teams building these networks used to work in mobile money, and seem to have designed certain facets of them similarly. For example, both mobile money and agency banking networks display similar levels of dedication, exclusivity, rural/urban locational splits, liquidity management techniques, and support systems. However, the differences may be even more intriguing, as we see bank agents being more educated, and willing to do much larger transactions for clients than mobile money clients. Bank agents are also displaying some growing pains, taking a longer time to register new customers, and still having 50 percent of their agents conducting 30 transactions per day or less. Banks will have to focus on these issues as they continue to expand their networks across Kenya. However, the outlook is positive given some of the mature metrics of agent support and management they are already displaying. The presentation examined impact from multiple angles including, the geographical expansion of the access to financial services. The access frontier is being expanded with at least 55,000 agents across the country, which is much higher than the approximately one thousand bank branches in Kenya. However, it seems like they might be constrained geographically. 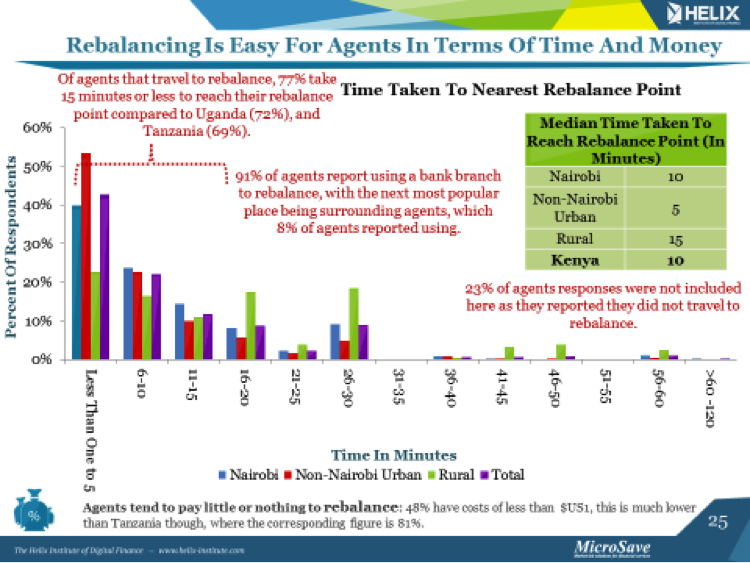 Of the 77 percent of agents that report traveling to rebalance their float levels, 77 percent of them say it takes them 15 minutes or less to reach their rebalance point. With 91 percent of them reporting using a bank to rebalance, this seems like the majority of Kenyan agents are concentrated around the financial infrastructure that we are trying to extend outwards. Further work is planned to look at the correlations to population densities, and try to determine the degree to which this is problematic. Agents feel like the market is saturated, with some reporting opening side business to supplement revenue, and only 58 percent of them saying they think they will still be an agent in a year. It seems likely that the number of agents on the market will contract. Safaricom’s M-PESA continues to dominate the market, and while the regulatory wind seems to be pushing towards non-exclusive agents, the high quality support they are providing to their agents’ means it will continue to be hard to wrestle market share from them. The addition of banking agents to the market is welcome, and they may be finding a different market need than mobile money such as showing the ability to conduct bigger transactions for customers. Finally, the agents are extending financial inclusion, but evidence indicates they many may be tethered to the existing financial infrastructure for rebalancing, and therefore further expansion into rural and remote areas may require superior liquidity management techniques. Overall, it is a very positive picture, from the frontier market in digital finance. Mike McCaffrey is head of digital financial services-Africa at MicroSave. Evelyne Matibe is training coordinator at the Helix Institute of Digital Finance.